nLots of Scottish fun: Scottish athletic competitions, Scottish Highland and Irish-step dancing performances, find your Scottish ancestry at the many clan information tents, children's games, Scotch whisky tasting, rugby tournament, sheepdog trials, Scottish living history displays, Scottish animals along with the Clysdale Horses and returning, The Birds of Prey. An after-games Ceilidh music party and barbecue and a wee bit more! Food and treasures: Taste a variey of Scottish food, beers and whiskies. Shop for unique gifts, handmade crafts, jewelry and clothing from Scotland, Ireland, Wales and England. 9 a.m.: Admission gate opens. 10 a.m.: Opening ceremonies (March of the Clans). 10 45 a.m.: Flowers of the Forest memorial ceremony. 12:30 p.m.: Marriage-vows renewal ceremony -- Scottish-style. 2 p.m.: Scotch whisky tasting seminar ($25 tasting fee). Well-behaved dogs on leashes are allowed. ATM cash machine is on-site. 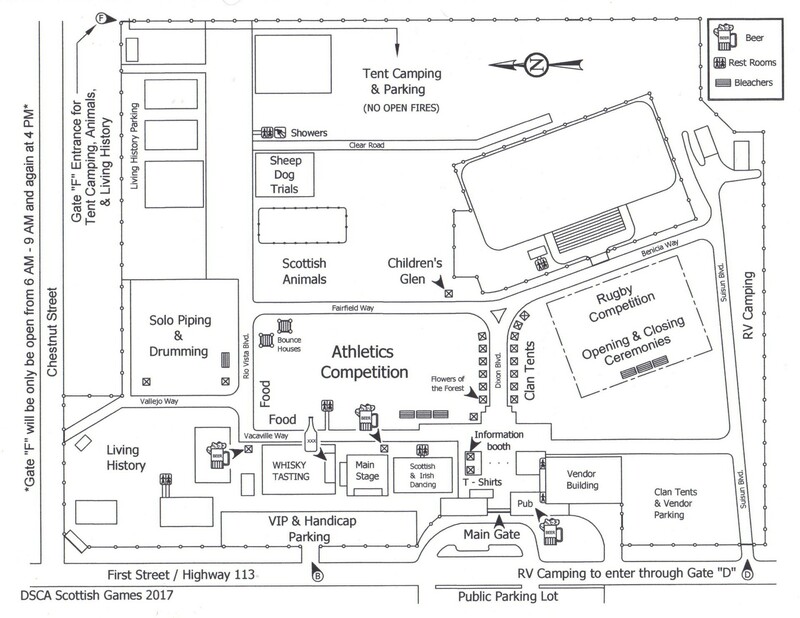 Overnight RV and tent camping is available on the Dixon Fairgrounds. Please complete the RV and Tent Camping Form on this page, to the left. The region's finest Scottish bagpipe and drum bands; including our Dixon Scottish club's home band, the Dunvegan Pipe Band. This year's games will feature local events for solo, trios piping and band quartets. Celtic, Scottish and Irish rock and folk music. The DSCA is welcoming to the 2019 Dixon Games The BlackEyed Dempsey﻿ and The Black Irish Band, DSCA's own, Duncan McMartin and his band Flask, and that's not all, entertaining our gathering will be Riggity Jig and back again, Michael Mullin "Trio of One."
. . . for helping us present our 2018 Dixon Scottish Highland Games. Click each sponsor's logo to find more information about them. If you wish to support us for 2018 games, please click the Become a sponsor link on the left of this page and read our donation-level packages and how to apply. We thank these generous community supporters . . .
Special event: Married couples are invited to renew their wedding vows, Scottish-style, at 12:30 p.m. on the fairground ceremonies parade field. Couples will be escorted by bagpipers and costumed living-history reenactors.